The information provided on this page is 'as-is' for private study only. While every attempt is made to be accurate, the information is not guaranteed to be free from errors or applicable to all examples of the model. 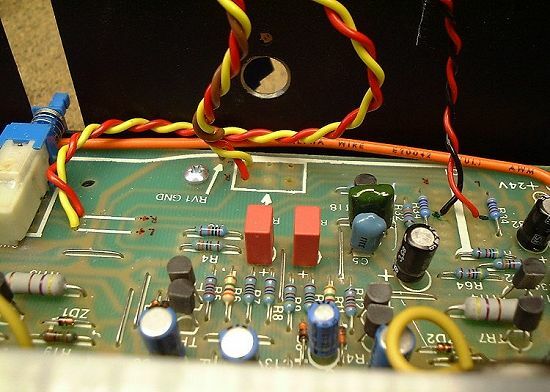 Dismantling, servicing or modifying your amplifier carries many risks - the most serious hazard is the dangerous mains voltages present inside the unit which might cause injury or even death. 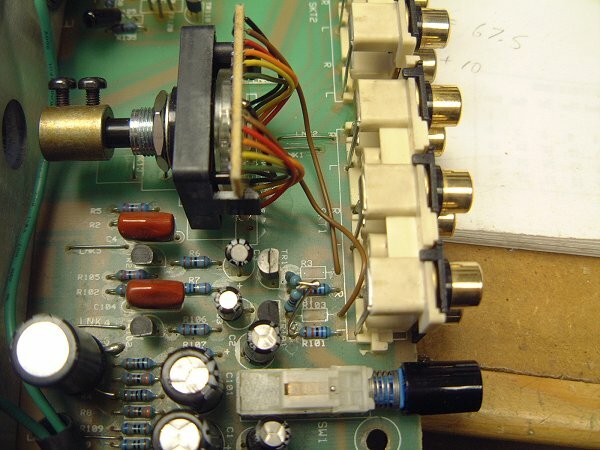 Servicing or modifying the amplifier may result in damage to the amplifier and your loudspeakers. The author disclaims all responsibility for any loss or damage and reading further implies agreement with this disclaimer. You have been warned! Because of the mechanical difficulties, the A1 is not a good amplifier to experiment with. There's limited space inside, and you can't run the amp without the top cover for any length of time. With no output protection, a faulty output stage could do some serious harm to your loudspeakers. In other words, it's not for beginners! I know of people who have gone to town with their A1, replacing components with expensive and exotic "boutique" variations. Apart from using low-ESR 105°C replacement capacitors, I personally wouldn't bother - but do bear in mind that I'm an engineer. I suppose you could try replacing the TL084s for something more fashionable... the OPA4134 might sound better and could perhaps result in a better signal to noise ratio - clearly you'd have to decide if the thermal noise from the resistors would dwarf the op-amp noise. But my feeling is that if you go to the trouble of removing IC1 (the line pre-amp), leave it out! Build my replacement preamp instead. So, if you want to try unobtanium magic capacitors or silver cable then be my guest, but I personally feel you'd be wasting your money. Noise is the potential problem with this; there's no point having a decent hi-fi that generates as much noise as a typical PC! So as you would want to run any fans as slowly as possible so that they are not audible from your listening position, some sort of speed control is essential. Given that the A1 was designed to work with no forced air cooling, even a relatively gentle draught will reduce the heat sink temperature appreciably. My plan was to build a separate unit that could sit alongside the amplifier, containing one or two fans and a simple speed control. I preferred to not build anything inside the amplifier because of the slight possibility of the electrical noise generated by DC fans getting onto the power supply rails. Also, there is limited space inside for anything other than the smallest fans, and these have to run at high speeds to shift air. Based on my experiences with fans, you should choose the largest diameter you can get away with. I was considering 60mm or 80mm fans - the latter size is typically used in PC power supplies, so they're easily found if you don't mind a bit of "skip diving". These would have been taller than the amplifier so the air would have been directed over the top of the amplifier as well as through the internals, which is no bad thing in my opinion. DC fans are easily controlled by varying the applied voltage, so either build a variable power supply based on an LM317T or similar, or if you're not that handy with a soldering iron, buy a plug-top power supply with a variable output - these can be found with a slide switch that lets you choose 3, 6, 9 or 12V. If you've read the technical page, you will have gathered that I didn't like the preamp! It simply had to go, as living with the amplifier was becoming impractical - and simply changing the volume potentiometer was going to be a waste of time and money. 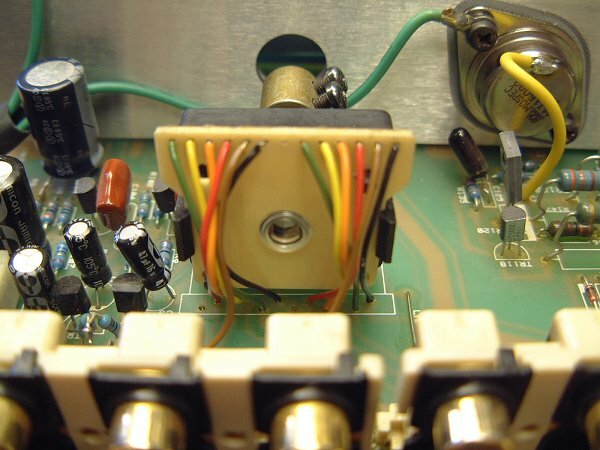 I know of a few people who have bypassed the preamp entirely, wiring a replacement potentiometer in the conventional manner and feeding it straight to the power amplifier. If you only ever listen to CDs, there's enough gain in the output stage to get away with that. But I use my tuner and other sources extensively, and most of these other sources had a lower nominal output voltage than the CD player. So I had to have a gain stage of some sort. It had to be unobtrusive sonically, have none of the DC problems of the original design, and be much less noisy. To minimise the noise problems described above, the gain stage needed to have no more gain than necessary, as any noise generated by it will be present at all settings of the volume control. The existing pre-amp in the A1 has rather more gain than is necessary, giving it an input sensitivity of around 200mV - this results in a rather "fierce" volume control, with most of the useful range concentrated in the first quarter of the mechanical rotation - a trick that gives a false illusion of output power, of course! With an 'average' CD, the unmodified amplifier would start to clip at a volume control setting of around 12 o'clock. The resistance of the original potentiometer at this setting is 8K - working out the overall gain of the two op-amps at this setting results in +1.5dB from input to power-amp. At the maximum setting, the overall gain is a massive +17dB - far more than is needed... Taking into account the nominal levels from all of my equipment, I decided that a gain of around +10dB to +12dB would be sufficient. Of course, this means that the volume control is not as fierce now and there is more range at lower settings. I decided to use the venerable NE5532 for the preamp. I know that it is an old device, but even today you have to spend a lot of money to improve on it. The biggest advantage is the excellent drive capability, meaning that with a non-inverting configuration, you can have very low-value components in the feedback path, minimising Johnson noise - remember, I was pretty paranoid about this issue at the time. You can try different op-amps in this circuit, but if you do, I'd recommend that you increase the value of R3 and R4 to reduce the loading on the op-amp, as many of the popular alternatives generate more distortion into loads less than about 2kΩ. You could simply increase them by a factor of 10 (to 6k8 and 2k2), but I'd recommend 3k and 1K. Good quality but affordable alternatives to the NE5532 include the OPA2604 and the OPA2134. I have tried the latter (with 3K and 1K gain setting resistors), and it worked fine... If trying anything more exotic, do take care with layout and decoupling, as parasitc oscillations are a very real possibility with some of the high-speed options. The first part of the circuit is an ultrasonic filter. Note that this is simply to avoid noise in the MHz range upsetting the op-amp*, and is not meant to be a bandwidth-setting component. The cut-off frequency varies with source impedance: -3dB @ 340kHz with 0Ω source impedance, and -3dB @ 190kHz with 1k source impedance. The amplifier bandwidth is set later by R4 and C5 on the main PCB. The volume control is a good-quality 10k log pot - deliberately low in value to minimise Johnson noise. Modern kit should be quite happy to drive this sort of load, although some exotic valve gear might not like it - in which case feel free to try a 50k instead... This pot is AC-coupled to the op-amp by a non-electrolytic capacitor. As above, the exact -3dB point is variable - this time the position of the volume control will influence it. However, it is low enough not to be a problem and the LF cut-off is properly defined by C6 and C7 in the power amplifier. When using the recommended NE5532, this circuit is not critical and can easily be built on Veroboard. The deliberately low impedances ensure that inter-track capacitance is not an problem. 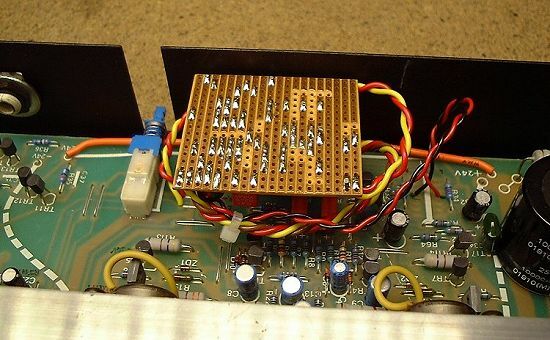 The small Veroboard assembly is held in place by the potentiometer and is connected to the PCB via short lengths of wire. These are soldered at both ends and made long enough to enable easy access - I decided not to use any extra connectors on reliability grounds. Replacement preamp is small enough to be supported by the new volume potentiometer. Ultrasonic input filter, showing the high-quality axial polystyrene capacitors. This picture shows the modifications required to the original PCB - fortunately it's very simple. Remove IC1 and the two wire links that carry the signal from the tape-monitor switch to R33. Easily reversible, if required. Next, take the power connections from pins 4 and 11 (red/black pair on right). Input comes from the removed links (red/yellow pair on the left). Finally, power-amp inputs are connected where the potentiometer was, feeding R4. There is also a connection labeled RV1 GND which is conveniently near to this latter pair (see the red/yellow/brown bundle). Before installation, I took the time to ensure the preamp was working by testing it with a bench power supply, signal generator and oscilloscope. As this unit connects directly to the power amp there is the chance of real fun if there is something wrong! Note that I have replaced C6 and C7 with 1µF polyester capacitors, which aren't bothered by any DC offset from the preamp. This has worked reliably since installation, and has transformed my day to day life with the amplifier. The pots and switches have remained noise-free, and the stereo image benefits from the improved tracking of the pot. The preamp is extremely quiet - with your ear held against the speakers you can just about hear some low-level hum coming from the power amp - there's no hint of hiss from the preamp. Obviously, this applies at all volume settings, unlike the original preamp. It's also well-behaved - there's no sign of instability, and the amplifier retains it's civilised pop-free power up/down. The strange effect of fading up, down and up again at power-on has gone. While it's hard to drawn any reliable conclusion on the effect on sound quality until I'm able to borrow an unmodified A1 to do a direct comparison, experience shows that the 5532 is a much better opamp than the TL084, so it's hard to imagine how this can be anything other than an improvement. So to your changes and my experience. Before the new preamp, the a1 had a touch of gain character in increasing volume like an guitar amp. Since built in your preamp it works very reliably and it sounds more like a highend machine, no more desturbing sounds or gain and both channel are at the same level (well balanced if you decrease volume, which is also professionalized by an alps poti). So you made it really becoming an perfect professional grown-up amp. For the preamp I used an OPA2134 (with which I had great results in an headphone amp) and the components list your sugested, except for the pot, where I re-used the Alps 50K from the A1. The preamp is working fine, is much quieter than the original, better tracking a lower volumes. The sound quality has definitely improved: wider soundstage, very smooth highs, the sense of "grain" in the treble is gone. It's worth saying that the improvement in tracking is definitely real; dual potentiometers are much better in this regard when being used as potentiometers as opposed to rheostats because the tolerance of the end to end resistance can be quite poor. Obviously, when used as a potentiometer, it's the ratio of the two parts of the track that matter, and this is generally more accurately controlled, provided the device has good mechanical construction. To assist constructors, the components required for the replacement preamp are listed here. Components starting from 100 are for the right channel. Note that the feedback components are different to mine, but as mentioned above, these are recommended if you don't want to use the NE5532. Part numbers and prices are from Farnell, in UK pounds. Note that these may vary, and will be affected by having to buy in quantity - for example, you need to buy resistors in packs of 50 (!) - for this reason you might consider using other suppliers. MF means Metal Film - these are recommend for best stability and accuracy. The input filter capacitor isn't critical, and values either side of this are absolutely fine. Finally, more information to help constructors will be added at some point, including a layout diagram and more detailed instructions. This component is hard to find, but Farnell sell an almost equivalent version. The switch itself consists of a plastic chassis which has two M3 screws for PCB mounting. The switch contacts are laid out on a PCB, which is fitted with pins and is intended to mate with the host PCB. Unfortunately, the pin-out is different compared to the original, and doesn't work with the A1. Incidentally, I had been asked to bypass the phono stage so that the owner could use an external phono preamp. This was simply a matter of lifting two resistors and connecting the brown wires (for input 1) in their place, as the next picture shows. Simple, and easily reversible if required. Note that the input resistors were connected to ground rather than being left floating. © Copyright 2000-2019 Mark Hennessy. All Rights Reserved. E&OE. All opinions expressed are my own, and not those of my employer.